Wait! 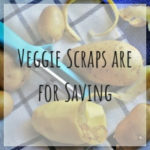 Save those veggie scraps! Put ‘em in a bag in the freezer. When it gets full, use them to make a healthy soup stock! Why should you do this? Make your food dollars go further. Reduce food scraps sent to the landfill (especially if you are not using them for compost). Don’t miss out on the vital minerals and nutrients in those peels!! Don’t throw your nutrition (or your money) away. Potato, sweet potato, carrot peels (wash produce before peeling). The ends of zucchini, yellow squash, etc. The stems of herbs (cilantro, basil, etc). Fill a very large pot with 8 cups water. Add the frozen veggie scraps (I usually have about 4 cups scraps in my big plastic bags). Add quartered onion, smashed garlic cloves, and other herbs or seasonings you would like. Bring to a boil and simmer for an hour. Let cool, strain the scraps out. Season the stock as desired, use now or later in any soup, sauce, etc. I like to pour the broth into plastic containers and freeze it for later use. Be sure to label it with the contents and date!